We live in the Age of the Lecture; an era in which virtually every forum or opportunity for communicating, becomes a vehicle from which to lecture us about something deemed important to those whose existence revolves around political correctness. Now, even an ad for something as mundane and apolitical as a shaving razor has become the means by which the PC crowd presses its worldview upon us. Politically correct lectures packaged as ads for toilet paper cannot be far behind. Recently, the iconic men’s grooming brand Gillette released an ad featuring not its latest advancement in shaving technology, but instead taking on the scourge of “toxic masculinity.” This transition from a product built on the masculine art of shaving one’s beard, to a campaign focusing on softness and goodwill, is odd in the extreme. It appears, however, that the public relations Brainiacs who dreamed up this campaign may have created more of a problem than a solution (to whatever the perceived problem might have been). At least those of us grown tired of politically correct subject matter being shoved at us via television ads, can hope it will backfire. Rather than striking a cord with its audience as a collective Kumbaya moment, Gillette’s latest ad appears to have struck a raw nerve with viewers. Ad Age, an advertising industry publication, reported that one marketing intelligence firm found 63 percent of social media’s reaction to the ad was negative, compared to just eight percent who viewed it positively. Does such responsive research mean that Gillette’s customer base is sexist, racist, or supportive of bullying? Hardly. 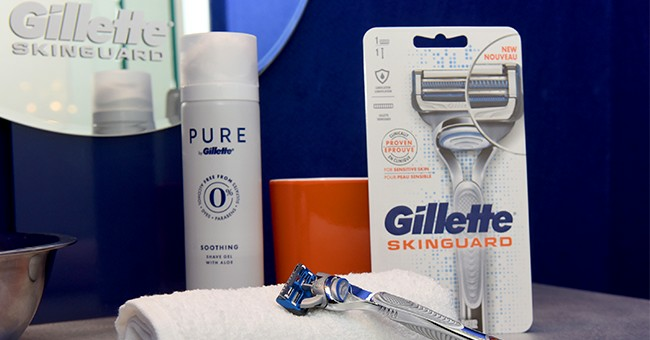 It does suggest, however, that Gillette’s core demographic is men who buy the company’s razors because they shave well; men who consider an ad should be an ad, not a political or sociological soapbox. The market research indicates that Gillette’s customers are men insulted with the idea that they need lecturing by a company that simply manufactures an inanimate object having nothing whatsoever to do with politics or public policy. Certainly not all ad campaigns succeed in their goal of increasing market share or product identification. What makes this ad campaign diving headlong into the thicket of political correctness bizarre, is that it breaks completely from all previous campaigns by Gillette; and in a way that manages to alienate its core market demographic. The 1985 debacle by Coca-Cola promoting “New Coke” apparently is history too-long forgotten to have been factored into decision-making for Gillette’s nascent “toxic masculinity” campaign. A company like Nike, which has built a sporting shoe empire on a liberal social agenda, can successfully employ a polarizing sports celebrity like Colin Kaepernick to boost its sales; people have come to expect it of the company. Starbucks Coffee, which has long and openly promoted a philosophy of love, peace and diversity, can fashion marketing strategies around such social messaging and survive. Gillette, however, is not a “New Age” company; its product has nothing to do with political or public policy, and never has. A shaving razor is a shaving razor; period. Men who use the product do not wear it on the street to impress others, as is the case with Nike shoes; nor do men gather together in public places to engage in group shaving, akin to the way Starbucks urges consumers to visit its stores to socialize as they imbibe its coffee drinks. Perhaps another reason why Gillette’s advertising gambit failed so badly, is that it comes just as Americans in large numbers are beginning to see through the incessant lecturing by liberal spokespeople in politics, academia, the film industry, and the media. People finally appear to be recognizing the hypocrisy of a Sen. Elizabeth Warren lecturing us on fairness; or a Democratic Party calling on citizens to fight sexual predation even as it continues to protect one of America’s most notorious sexual predators, former President Bill Clinton. Consumers may finally have reached the end of their patience with the vacuous moralizing that has become standard fare emanating from Hollywood, Washington, DC and Silicon Valley. While I share with many of my fellow citizens the frustration with having to sit through ads focusing on erectile dysfunction, hemorrhoids, constipation, and every form of malady known to mankind, in order simply to watch the news or a sporting event, I prefer that to a shaving company lecturing me on how it believes I should live my life.